"Well, you're an Air Faerie," the Earth Faerie responded, "and I don't see many Air Faeries with their heads out of the clouds." "It's not my fault! That genetic combination was clearly marked as a Jetsam. I was as surprised as anyone..."
Mina scrunched up her face before stomping out of the room. "It's not fair..."
"My dear friends and countrymen! The day we have so longed for is finally come! The day that we celebrate our most prized food! Our wonderful... delectable... CHEESE!" "I don't know my family. I'm a pound veteran. I was in that place until I was eighteen." Have you ever noticed just how many Aishas there are in Neopia versus other pets? Sure, you do see other pets, but almost everywhere you go, you see an Aisha or two. I certainly noticed this, and traveled Neopia to find out how many Aishas there really are. You already have a petpet. 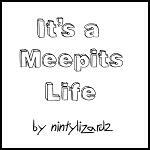 Ever wondered what your average Meepit gets up to when it's not plotting to take over Neopia...? !